Oamaru, New Zealand is probably best known for its large colony of blue penguins. People journey from all over the world to watch rafts (that’s what a water-borne group of penguins is called) of these small, flightless birds return from the ocean at sundown each night. 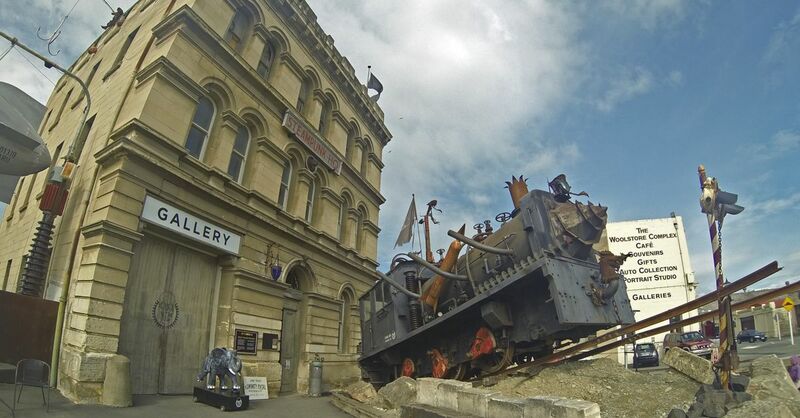 But, to those in the know, Oamaru is also the steampunk capital of New Zealand. Many New Zealand towns boast they are the world capital of something (carrot capital, gumboot capital, kiwi capital, kiwi fruit capital, and so on—there’s a pretty complete list on Wikipedia), but the steampunk capital seemed a bit of a stretch. Once we started exploring the town, though, we learned that Oamaru has a well-preserved historic Victorian district, so from there it’s only one minor conceptual shift in thinking to make Oamaru a bastion of all things steampunk. To the town’s credit, it’s fully embraced the steampunk vibe, going so far as hosting the annual 3-day Steampunk NZ Festival (2015’s is scheduled for May 28) and creating a steampunk-themed playground—complete with an elephant howdah zipline, a pennyfarthing swingset, and a Victorian-age rocket slide—that my daughters have declared as the best playground in the world. And right smack in the middle of all this steampunky goodness is Steampunk HQ, a industrial-inspired steam-powered art gallery and retro-futuristic showroom set up in a massive, three-story Victorian-style sandstone building originally built in 1883 (it used to have five stories but lost two in what they say was a “spectacular fire”). You quite literally cannot miss the place. It’s down by the waterfront, right next to the train tracks. A fire-breathing steam engine, designated SP001, looms large in front of the building, and a giant shark-mouthed steampunk blimp, hanging over a mysterious set of double gates, demands to be noticed. Even if you approach from the opposite direction, you’re greeted by a grinning, goggled skull (the Steampunk HQ logo) laser-cut out of sheet metal and mounted on the side of the building. With all that going on outside of the place, we had to check out the inside. After paying the price of admission (quite reasonable at $10 for adults, $2 for children, and $20 for families), we walked through a door into a darkened room where we were thrust immediately into an alternate world of bizarre contraptions, spooky figures, strange flickering machines, cages of copper tubes, and working gadgets powered by gas cylinders and steam. The whole gallery is filled with otherworldly sounds and projected images that complement the sculptures and other creations, and visitors can take a seat in two different arcane styled viewing rooms to watch a set of avant-garde, looped movies. The newest attraction in the place is the Infinity Portal, a small room with mirror-lined walls, ceiling, and floor and filled with a lattice made from hundreds of LED lights. You need a special coin to even enter the thing (each group gets one as the price of entry), and shortly after visitors shuffle inside to stand on a small, metal balcony, an ambient soundtrack kicks in as the lights shift colors, and the whole room spins off on a short journey through time and space (or so it seems). It was a cool, slightly disorienting experience. When you’re ready to leave the gallery, an understated set of doors leads outside to a large yard filled with a whole bunch of machines in various stages of steampunk construction, like the “Aethertractor,” a giant motorbike, a skeletal-visaged freight train, and even a rocket to the moon. We had a lot of fun wandering around this yard and through works in progress: climbing on the machines, playing with all sorts of gears and gadgets, and exploring the many nooks, crannies, hiding spots scattered about the area. If steampunk’s your thing, and you happen to be on New Zealand’s South Island, then a trip to Steampunk HQ in Oamaru is worth your time.